This is the fourth installment in a series of posts on California's climate leadership. These posts address a wide range of related topics including economic benefits, renewable energy, electric vehicles, and cap-and-trade. 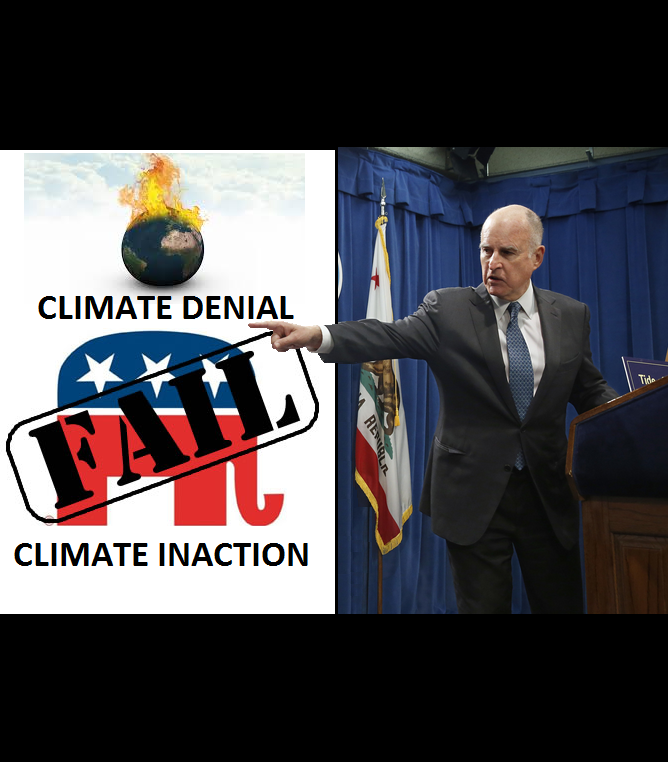 California Governor Jerry Brown unambiguously ascribes blame for climate inaction in the US to the GOP. Republicans currently control the Executive and the Legislative branches of government. The GOP not only ignores climate action they undermine public awareness by subverting the facts. As explained by Gov. Brown, the GOP has, "a slavish adherence to the non-belief in anything to do with climate change." Brown could not be more clear when he said the rhetoric coming out of Trump and other Republicans is both, "implausible" and "stupid." He went on to ask the GOP, "Where are you? You’re in an ‘Alice and Wonderland’ world." Republicans are deceiving Americans, they even obfuscate about their climate denial by suggesting they are "skeptics". One of the tenets of their broken logic states that there is a global conspiracy among climate scientists who are clamoring to somehow "cash in". The fact is that scientists who subscribe to a dissenting view on climate change are far more likely to get funding from front groups controlled by wealthy patrons in the fossil fuel industry. Others say climate change requires more study. However, scientists have been studying climate change for years making it one of the most studied phenomena in human history. To all but the willfully ignorant, the science is settled. The consensus among those in the know is about as convincing as it gets. "The Republicans are committed to global warming as a hoax, or irrelevant, or as not a problem. That is their belief," Gov. Jerry Brown said. Approximately one-third of Americans do not believe in anthropogenic climate change. It is important to note that roughly the same percentage of Americans do not believe in evolution. We must accept that some are impervious to the facts. Whether this is due to dogmatic beliefs, political motivations or financial incentives makes no difference. We simply cannot afford to wait for the holdouts to come around. They may never see the light and we do not have the time. "We got to go against the flow [of Republican denial and skepticism]... Because the flow is now leading us to catastrophe," Gov. Brown said. Brown is standing up to this deceitful party and this egregiously ignorant administration. He has indicated that he is prepared to fill the void in the wake of the Trump administration's defunding of climate science. "We’ve got the scientists, we’ve got the lawyers and we’re ready to fight. We’re ready to defend," Brown said at a meeting of the American Geophysical Union conference in San Francisco. Brown has indicated that if Trump refuses to collect climate data from satellites, "California will launch its own damn satellite". He also indicated that he would protect the state’s renowned science facilities from the Trump administration's onslaught. Republicans have painted themselves into a corner on the most important issue of our times. To secure funding from wealthy donors the GOP plays politics with the science of climate change. They are shamelessly pandering to the fossil fuel industry and the one percent. This is an assault on the health and well-being of both people and the planet. Such unconscionable conduct will not be remembered kindly by history.